Each year over 100 from across BC took part including high school and university students, faith community leaders, dietitians and many others. They pointed out that they did not have a healthy diet, were short of energy and nutrients, tended to be grumpy and food became a source of stress rather than pleasure. Many commented that food is so important to social connections and they suffered from not being able to share a coffee or food. Even trained chefs and dietitians could not provide themselves with a healthy diet. It is impossible to have a healthy diet on welfare. Several people gave up before the week was over because they could not cope. People on welfare do not have this choice. They live on a poverty diet week after week. 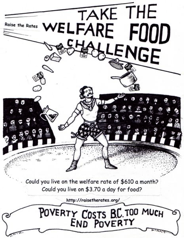 Raise the Rates thanks all the people who took the Welfare Food Challenge. For more information on the challenge, participants, media and social media coverage, etc. click here.